Huge Savings Item! Save 15% on the Marmara Aleppo Peppers Flaked Crushed Red Pepper Spice 8 Oz by Marmara Share the Delight at 365 Days Of Kindness. Hurry! Limited time offer. Offer valid only while supplies last. At Marmara, we bring you a taste of the Mediterranean and its traditions through our spice collection which will compliment any meal you prepare. At Marmara, we bring you a taste of the Mediterranean and its traditions through our spice collection which will compliment any meal you prepare. 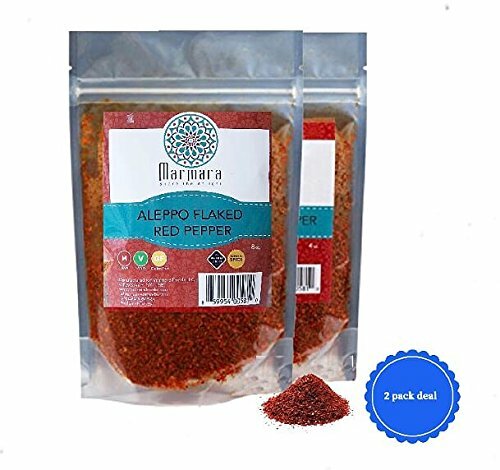 Unlike the usual dry stuff, Marmara Aleppo Crushed Flaked Red Pepper is unique in that it is moist so it blends into the overall flavor of food. Its not too hot, but full of flavor of peppers. The color of the red pepper seems to bleed into the food it is added to which makes it a pleasant addition to any cuisine. FLAVOR: Our Aleppo Crushed Flaked Red Pepper comes from southern Turkey. It has a mild heat level with some fruitiness and mild cumin-like undertones. Unlike regular crushed red pepper, Marmara's Flaked Red Pepper contains no inner flesh or seeds, making it mild, yet very moist. It will add depth, color and zest to any meal. Use it in kababs, stews, or vegetable dishes, or use it as a condiment to top any meal. QUALITY: At Marmara, our spices show infinite variety in their form, characteristics and function in enhancing any cuisine. We bring you these traditions through our spice collection which will compliment any meal you prepare. FRESH and MOIST: Our Aleppo Crushed Flaked Red Pepper is packed immediately into resealable packs so it retains it fresh pepper aroma, and taste, but most importantly, its moisture. It is known for its moist richness and its vibrant color. Vegan and Gluten Free. Allergen Information: May be processed in a plant using tree nuts, peanuts, sesame and poppy seeds. PRODUCTS: Try our other Spice blends hand mixed to ensure freshness and great taste; like our Adana, Kabab, BBQ, Chicken, Soup, Salad and Curry Blends. If you have any questions about this product by Marmara Share the Delight, contact us by completing and submitting the form below. If you are looking for a specif part number, please include it with your message.